In view of the conflicting opinions published, a meta-analysis was undertaken on epidemiological studies in order to assess any association between Dupuytren's contracture and work exposure. Using the key words: "occupational disease", "work" and "Dupuytren contracture" without limitation on language or year of publication, epidemiological studies were selected from four databases (Pub-Med, Embase, Web of science, BDSP) after two rounds (valid control group, valid work exposure). A quality assessment list was constructed and used to isolate papers with high quality methodological criteria (scores of 13 or above, HQMC). Relevant associations between manual work, vibration exposure (at work) and Dupuytren's contracture were extracted from the articles and a metarisk calculated using the generic variance approach (meta-odds ratios, meta-OR). From 1951 to 2007, 14 epidemiological studies (including 2 cohort studies, 3 case-control studies, and 9 cross-sectional studies/population surveys) were included. Two different results could be extracted from five studies (based on different types of exposure), leading to 19 results, 12 for manual work (9 studies), and 7 for vibration exposure (5 studies). Six studies met the HQMC, yielding 9 results, 5 for manual work and 4 for vibration exposure. Five studies found a dose-response relationship. The meta-OR for manual work was 2.02[1.57;2.60] (HQMC studies only: 2.01[1.51;2.66]), and the meta-OR for vibration exposure was 2.88 [1.36;6.07] (HQMC studies only: 2.14[1.59;2.88]). These results support the hypothesis of an association between high levels of work exposure (manual work and vibration exposure) and Dupuytren's contracture in certain cases. Dupuytren's contracture is characterized by chronic contracture of the fourth and fifth fingers of the hand toward the palm, usually accompanied by thickening of the palmar skin [1–3]. Prevalence rates range from 0.2% to 56% in various age and population groups, and methods of data collection . In his presentation on December 5, 1831, at the Hotel-Dieu in Paris, Baron Guillaume Dupuytren clearly identified the main lesion of the disorder as contracture of the palmar fascia, which he asserted could be surgically treated by excision of the palmar aponeurosis . In that lecture, Baron Dupuytren associated the disease with chronic local trauma caused by occupation . "Most people with this disease have been obliged to do work with the palm of the hand or to handle hard objects. Thus the wine merchant and the coachman whose case histories we will report were accustomed, one to broaching casks with a puncheon or to binding up staves, the other to plying his whip unceasingly on the backs of his jaded horses. We could also cite the example of a clerk in an office who took particular care in applying the seal to his dispatches. It is also found in masons who grasp stones with the end of their fingers,[...]. For this it is clear that the disease affects particularly those who are obliged in their work to use the palm of their hand as a pressure point." Previously, Henry Cline, Sr., a prominent London physician, recognized the disease in 1787 as one contracted by "laborious people" . In 1822, Sir Asteley Cooper attributed the contracture to "excessive action of the hand, in the use of the hammer, the oar ...". Although there is general consensus concerning certain genetic predisposing factors  and other risk factors such as diabetes, smoking and alcohol intake (with discussion about epilepsy/anticonvulsant drugs) [3, 8], the apparently conflicting results regarding the possible work-related origin of this disease are still a subject of debate [9, 10]. 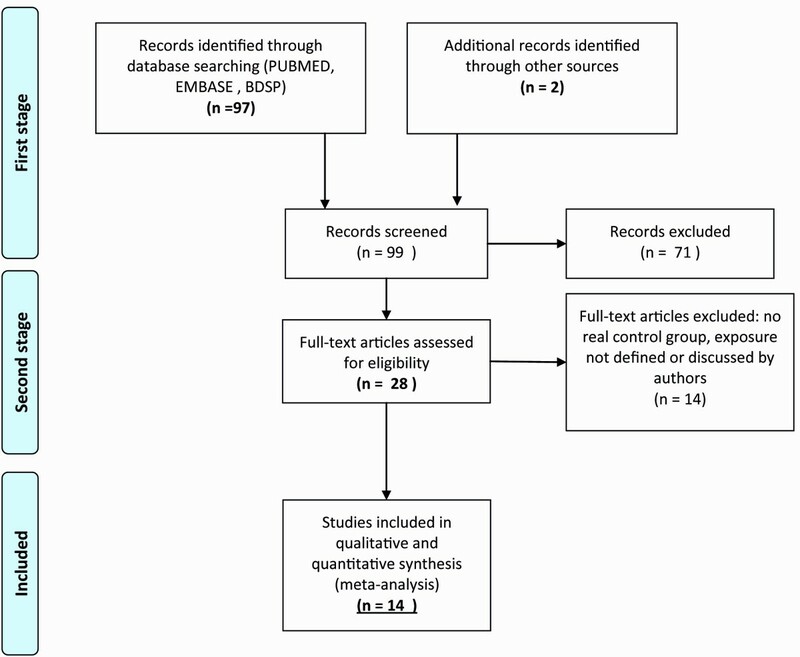 A systematic review to address this controversy in 1996 concluded that there is good support for an association between vibration exposure and Dupuytren's contracture, and a weaker association with manual work (5 studies but only one met the criteria suggested by the authors for methodological quality) . The authors suggested then that further studies are needed with better characterization of exposure in that area, and highlighted the prevention consequences for workers and ergonomists/occupational practitioners. However, since this comprehensive review, occupational exposure and vibration have not been considered by many clinicians as potential risk factors for Dupuytren's contracture [2, 4, 12], although additional studies published in the last ten years have supported an association between work exposure (manual work and vibration) and Dupuytren's contracture [13, 14]. The aim of this study was to undertake a systematic review and meta-analysis of the available epidemiological data regarding the association between work exposure (manual work and vibration exposure) and Dupuytren's contracture. Four databases (Pub-Med, Embase, Web of science, "Base de Données de Santé Publique", BDSP, i.e. the French Public Health Database,) were searched by using the key words: "occupational disease", "work" and "Dupuytren contracture". No language limitation was added. Interesting papers originating from the reference list of full-text papers and reviews were also included at this stage. The first selection of articles was performed by two independent readers based on the title and abstract to include only (i) original epidemiological studies (with control group, case series not included), for which (ii) the association between manual work (either heavy manual labor or exposure to vibrations) and Dupuytren's contracture was reported, with occupational exposure clearly described (exposure defined or at least discussed). The second stage included full-text papers, based on the same criteria, and only studies meeting these criteria were included in the meta-analysis after review by the independent readers (A.D. and P.J.). A quality assessment list was constructed using criteria from the Cochrane Centre, and recent reviews on musculoskeletal disorders at work [15, 16], adapted to Dupuytren's contracture. The list comprised five topics covering 20 items in total: i.e. study population, assessment of exposure, assessment of outcome, study design and analysis and data presentation (Appendix 1- Additional file 1,). Two reviewers (A.D. and P.J.) independently assessed the quality of each study by scoring each criterion as positive or negative. Disagreement was resolved by consensus. The quality score for each study was calculated by adding together the number of positive criteria. The high quality methodological study criterion was based on a total score of 13 or higher. The threshold was chosen to represent over two-thirds of the scale. Relevant data were extracted from the articles. The core findings in each article were expressed by measures of association (odds ratio) with corresponding 95% confidence interval (CI). When possible, such associations were directly extracted from the original article (with adjustments if available). In articles where this information was not presented, associations were calculated if sufficient raw data was provided and in some cases by contacting the authors. If two OR were presented in the study and if they concerned different exposures/populations, both were included. However, if the exposure was similar, only the OR related to the most precise exposure, higher dose and/or adjusted model was included. Results were treated as all work exposure together, then divided into manual work and vibration exposure. 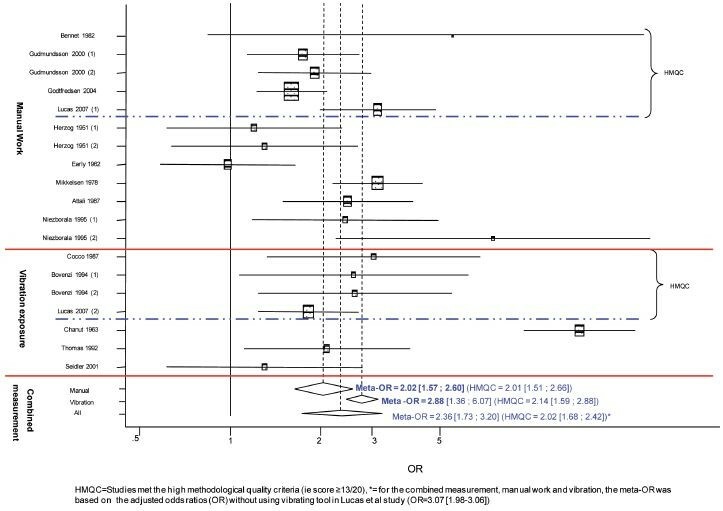 Metarisks (meta-odds ratios, meta-OR) were also run only on high quality methodological studies in each exposure sub-group. Meta-ORs were calculated using the generic variance approach. The weight given to each study is the inverse of the variance of the estimated effect. Heterogeneity was tested with the Q statistic. From the Q statistic, we calculated summary OR and 95% CI with the random effect method . This approach provides more conservative estimates (wider CI) than a fixed effect model, assuming that the differences between results are solely due to chance. We explored publication bias due to study size by drawing Funnel plots and testing with Egger's regression approach. The meta-analysis was performed using STATA (Version 10.0 ; Stata Corp., College Station, TX, USA). The MOOSE and PRISMA checklists were used (Appendix 2: Additional file 2) [18, 19]. We found 99 papers in the four databases corresponding to our first stage, and 28 papers were included and scored blind after reading the abstracts and titles and using cross references (second stage, Figure 1). After full-text reading, four papers not related to work exposure and 10 papers that were not methodologically appropriate were excluded (no real control group, [20–26] exposure not defined or discussed by authors) [27–29]. Flow diagram (adapted from ). Table 1 presents the 14 papers selected for the meta-analysis (10 in English, 2 in French, 1 in Italian, 1 in German) [13, 14, 30–41]. The studies originated only from European countries, mostly Northern Europe (one in North and Central Italy, one in Sardinia), and were published from 1951 to 2007 (6 studies published since the review of Liss and Stock in 1996) . Cross-sectional design and population survey were found in 9 studies of 14 (3 case-control and 2 cohort studies). Clinical examination was the diagnostic method for all studies. Exposure was assessed differently, including job title, self-reported exposure and measurements (for vibration exposure). Two different results could be extracted from five studies, as they were based on different types of exposure: based on different groups of exposed jobs [13, 32, 38], different populations , or a particular subgroup with different types of work exposure, manual work and vibration . After contact with the authors, overall biomechanical exposure ("all") included: using a tool with a handle or a vibrating tool, manual handling and repairing mechanical equipment. For the combined meta-OR of vibration (using a vibrating tool) and manual work (using a tool with a handle, manual handling and repairing mechanical equipment) were considered separately. *: met the high quality methodological study criterion (score of 13 or above). ****: heavy work was for instance lumberjacks, full time farmers; light manual work (or none), dentists, clerks, vicars. Six studies met the high methodological quality criteria (≥13/20, 9 results, good agreement between the two readers, >90%). Five studies reported a clear dose-response relationship (higher exposure corresponding to higher OR or more severe disorder), whereas one did not, but this sample included only workers with vibration white finger syndrome . The overall meta-OR was significantly higher than 1 (Figure 2): the meta-OR for manual work was 2.02 [1.57;2.60], and the meta-OR for vibration at work was 2.88 [1.36;6.07]. The meta-OR calculated from the studies which met the high methodological quality criteria was similar to the meta-OR of all studies (2.01 [1.51; 2.66] and 2.14 [1.59;2.88] for manual work and vibration exposure, respectively). Funnel plot and Egger's test did not suggest a major publication bias. Forest plot. The black square and horizontal line correspond to the studies' odds ratios (OR) and 95% confidence intervals. The area of the black squares reflects the weight each study contributes to the meta-analysis. The diamond represents the meta-OR with its 95% confidence interval. The results of this meta-analysis support the hypothesis of an association between high work exposure, manual work and exposure to vibration, and Dupuytren's contracture in certain cases. There may have been a publication bias, although we feel it was not an issue here. Indeed, negative studies have been published and were included in our initial list of selected papers [30, 32, 41] and in the second round of selection [20, 23, 26–29]. Egger's test and funnel plot did not reveal publication bias. The methodology used to select papers and extract data from them may also have induced a bias. Blind reviewing with scoring helped to reduce this effect, especially with the good agreement between the two readers. The choice of the OR used in the meta-analysis may have been inappropriate in cases of high numbers of results, but this seemed to be a minor problem in this review because of the similarity of the results, except for the study by Godtfredsen et al . The education variable was considered be compatible with the authors' choice instead of physical activity at work to when it was included in their last adjusted model (considering that low educational level is strongly correlated with manual work and hence a a proxy for it). Out of the 10 papers not selected because of major limitations, four were positive. Another strong element supporting validity was comparison with the 1996 review by Liss and Stock . Although the criteria used were different (selection and quality scoring), there was a good overlap between studies (before 1996) which met their high methodological quality criteria and those presented here: of the four studies meeting their validity criteria [30, 37, 38, 40], three of them met our high methodological quality criteria [30, 37, 38], and no other high quality paper published before 1996 was selected for our study. It is also necessary to consider study design since only two cohort studies were found. In cross sectional studies, workers with Dupuytren's contracture may be more likely to describe their work as strenuous. However, studies were selected on the basis of exposure provided with relative precision (in order to limit any potential recall bias) and one on vibration measurements . Clinical assessment was used in all of the studies retained, because this is considered to be the gold standard for Dupuytren's contracture , with a good agreement between clinicians (kappa statistic from 0.7 to 1.0) . When the differences between negative and positive evidence on associations between occupational exposure and Dupuytren's contracture were examined, the main difference observed was exposure quantification: "manual work" appears to be not sufficiently precise to be related to Dupuytren's contracture, which probably explains why many studies based only on job title were found to be negative in large populations with heterogeneous levels of exposure [29, 32, 33]. This meta-analysis showed that high cumulative work exposure (intensity × duration) was associated with Dupuytren's contracture. Manual work and vibration exposure are closely related in many jobs . The dose-response relationship found in 5 publications supports this association. The lack of dose-response reported by Thomas et al was possibly due to selection bias, with subjects highly exposed to vibration (enough to have vibration white finger syndrome) . Dupuytren's contracture is currently considered to be a fibroproliferative disorder, with dysfunction of connective tissue and fibroblast proliferation. Although the cause and pathophysiology are still the subjects of much research, many elements have recently been discovered . The roles of high levels of repetitive strain and vibration exposure are plausible, especially as a result of the local hypoxia and chronic ischemia hypothesized in Dupuytren's contracture [8, 43]. All the studies originated from Europe, mostly Northern Europe, probably because the prevalence is higher there than elsewhere. There is also probably genetic susceptibility to the disease [7, 8, 28]. However, a genetic predilection does not modify the consistency of the results and the conclusions, as discussed by Niezborala et al , or the lack of interaction between work exposure and familial history of Dupuytren's contracture found in Lucas et al's study . Similar magnitudes of strength of association found in the different studies presented reinforced the plausibility of a causal relationship. The conclusion of this meta-analysis is that high cumulative exposure to physical constraints in terms of force and/or vibrations transmitted to the upper limbs was associated with the occurrence of Dupuytren's contracture, at least in European countries, confirming and reinforcing the review of Liss and Stock. Work compensation in some cases with documented high levels of exposure and the few other risk factors should therefore be discussed and in some cases awarded. In each case of Dupuytren's contracture case, the occupational practitioner should discuss improvements in working conditions with ergonomists, in order to slow the evolution of the disorder and/or its consequences or at least prevent new cases in workers with similar tasks. Long-term longitudinal studies on large samples with valid exposure, taking into account the effects of interactions with other risk factors, would be valuable. The authors are members of research units in occupational health and A Descatha, Y Roquelaure and A Leclerc are members of the Musculoskeletal Committee of the International Commission of Occupational Health (ICOH), and the French Language Research group on MSD. high quality methodological criterion (figure). A Descatha designed the study, and participated in data collection, data interpretation and writing. P Jauffret participated in data collection, data interpretation, commenting on the manuscript and improving the English. JF Chastang performed the analyses and constructed figures and participated in commenting on the manuscript. Y Roquelaure and A Leclerc participated in the development of the study, data interpretation, and commenting on the manuscript.